For 2012, I participated in 3 challenges and was quite successful in two of them and need to make more of an effort in the third for this next year. So in this post, I am going to wrap up all three of my challenges. I have a post scheduled for January 2nd to tell you about my 2013 challenges, hint I will be basically doing the same challenges next year! The Where are you Reading Challenge was easy to complete and I loved watching as the year progressed where most of my books tended to take place. I am an East Coast reader and love books that that take place in New York City. Thankfully, I was able to visit NYC twice this year, great to put a face to a place or something like that! My map can be found here - Kristin's Where are you Reading Map. As it is easier to list the states that I didn't read a book in, I will do so - Nevada, Montana, North and South Dakota, Wyoming, Colorado, New Mexico, Oklahoma, Ohio, Tennessee, and Delaware. (definitely an East Coast reader). The countries that I did read books in were Canada, UK, France, Italy, Spain, Bulgaria, Israel, Kenya, China, Pakistan and Brazil - I was quite the worldly reader this year! The 2012 Ebook Reading Challenge was the challenge I was most excited about because I have been reading more and more on my nook in various places, so I enjoyed tracking how many ebooks I read this year. 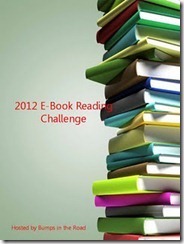 I outdid myself to the extreme in this challenge, I wanted to read 25 books and was able to finish 88 ebooks. I would say I definitely completed this one! 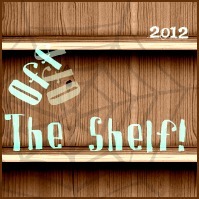 The final challenge that I participated in for 2012 was the Off the Shelf Challenge. This would be my failure for the year. I wanted so badly to read books that had been on my shelf for a bit and either keep them or send them on their way - it just didn't happen. I kept getting books in all year round that trumped what was currently on the shelf. My goal was to read 50 books the were placed on myself before the beginning of 2012, I only read 5 books. Maybe I will be more successful in 2013. We should challenge each other this year to get books off our shelves - and not pass them from yours to mine or mine to yours! !